It’s been almost three centuries since Bach wrote The Well-Tempered Clavier, a simple set of compositions that became definitive in music theory. J.S. probably would’ve been surprised—but delighted—by the work of Luisa Pereira, who has translated some of his rules into the most modern form imaginable: The sequencer. The resulting handmade sequencers—there are three—each deal with a different compositional rule. For example, there’s The Counterpointer, which is programmed according to the Baroque rule of Counterpoint. First, you input a melody. Then, the machine creates a counter-melody—and then, a tertiary counterpoint melody (check out Bach’s famous example here). Then there’s El Ordenador, a long, thin box that starts by generating a crazily random series of chords. By flipping three switches, you can force the chords into a more organized, tonal progression. One switch controls “efficient voice leading,” one controls “harmonic consistency,” and another adds “diatonic macroharmy.” (These terms come from modern-day musicologist, Dmitri Tymoczko, who uses them to describe tonality in music.) 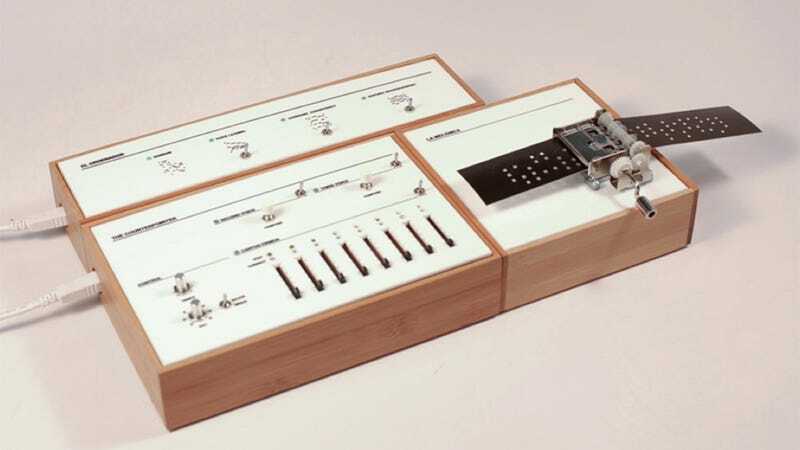 Finally, the third sequencer is actually just a music box—which plays back the melodies created on the other machines.